Perth, the capital of Western Australia, is a lively and modern city with a stunning location on the Canning and Swan rivers, with the azure blue of the Indian Ocean to the west and the imposing Darling Ranges to the east. The beauty of this city is enhanced by some of the best beaches in the world, onto which break the warm waters of the Indian Ocean. 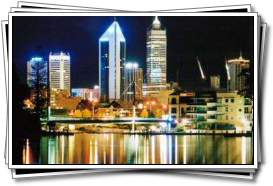 Perth has many cosmopolitan districts, romantic scenic areas and suburbs that gracefully line the banks of the river. 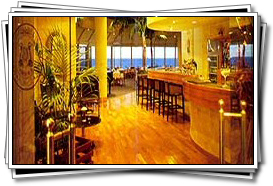 As with many of the larger Australian cities, there is an active nightlife and a wide range of cuisine available, of which the seafood is most exceptional. 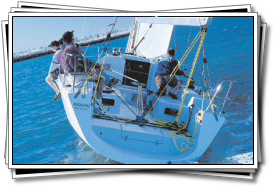 Breaking out from the beautiful beaches, the Perth area is rightly famed for the exciting fishing spots off the coast, and sailing is a perennial activity. The whole region around the city of Perth has been described as one big holiday resort with so many attractions, a sunny Mediterranean climate that allows for all sorts of outdoor activities, miles of clean beaches and gentle waterways, a wide variety of fine dining, and accommodation to suit every budget. Few holiday destinations in the world can offer as much as this area of Western Australia, with its vast and unspoiled natural beauty and unique wildlife. Places to visit include the World Heritage listed area of Shark Bay, Shell Beach, the mystical lunar-landscape of the Pinnacles Desert and the lobster fishing town of Port Denison. An ever popular attraction are the beaches of Monkey Mia, where wild dolphins visit the beach and interact with people. The dolphin appearances cannot be guaranteed, but this has been a daily routine for these friendly and intelligent mammals for many years. Perth, along with most of Western Australia, is generally mild and sunny. The city features hot, dry summers with long hours of sunshine that are perfect for outdoor activities. Spring and Autumn are bright and enjoyable. Winters are mild and wet. In spring and autumn, when temperatures are pleasant and rainfall is minimal. Perth is a brilliant holiday destination for families as well as a great starting point for those looking for an adventure holiday further afield in Western Australia. It's also great for couples looking for a short get away as you can visit both the Swan Valley and Margaret River wine regions, each one just a short drive from central Perth. 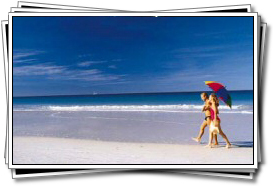 Or just stay in Perth and enjoy the beautiful city and surrounding areas, beaches, zoo and animal parks. Perth is a fantastic place to live and is especially suited for families with young children. The entire metro area seems to be geared towards families with parks and playgrounds everywhere not to mention excellent health and educational facilities. Accommodation prices and availability vary by area but you will always be able to find a house to rent, buy or get one custom built. The combination of beautiful weather, robust economy and good infrastructure make Perth an ideal place to settle in.